This is my very first time participating in the Top Ten Tuesday! Are you excited for me? It's ok, you don't have to be. I'm excited enough for the both of us. I don't believe that beach reads necessarily have to be easily digestible books. I don't think that reading a big fat classic while sand is getting into all of your crannies is great either. I've tried to pick some books in betwixt the two extremes. Jaws by Peter Benchley - Because duh. I think it's a test of our readerly mettle. If you can read this on the beach and still go in the water you are a true lit lover. The Storied Life of A.J. Fikry - This book will be on every list of books I ever make EVER. It's that good. Lost Lake by Sarah Addison Allen - This takes place on a lake so it's kinda a no-brainer. Love Water Memory by Jennie Shortridge - Another easy pick...it's a good book that starts out in water. Ella Minnow Pea by Mark Dunn - This backlist title hasn't been shown nearly enough love. It's absolutely perfect for word nerds. *Such as choosing only 5 books for the Top Ten Tuesday. Ha! Have a good one, ya'll! I'm so glad I had the perfect excuse to use this gif. I'd be that odd person on the beach reading War & Peace. Heh. When people ask me for beach-read recommendations, I always think, "As opposed to...?" Ha ha! Love that :D I've never subscribed to the idea that we're supposed to read fluff in the summer. I just don't get it. You may have only picked five but I've just added The Storied Life of A.J Fikry and Ella Minnow Pea to my wishlist so you've not done too badly :-p they sound amazing! That's great to hear! I completely vouch for both of them...GREAT reads. They should title it "up to 10 Top 10 Tuesday!" I can usually only pick out 3. 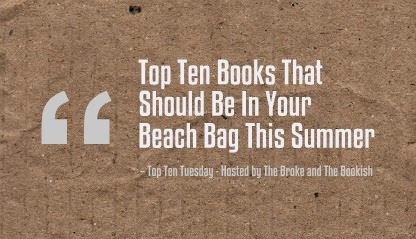 I totally agree with the rules for your list - I tend to hate the thought that books need to be soft and fluffy just because they're going in a beach bag. I'll definitely be reading A.J. Fikry this summer! Wonderful, I sure hope that you do read Fikry, it's bookishly wonderful! I love that you included Jaws. Perfect. And don't worry, I often do Top Tens with less than ten. I think a summer readalong of Jaws would be kinda brilliant...hmmmm. Thanks! I'm glad I'm not the only one! I'm new to Top Ten, too. But I didn't manage one this week, because I can't get pass being grumpy that Missouri is a very long way from the beach. We have zillions of lakes around here ;) I'm sure it's quite different from the oceanic beach but still. Agreed, Ella Minnow Pea is great and does not get enough love. Oddly enough I did read Jaws at the beach then went swimming: jumping when something touched my leg and scanning the horizon for fins. Another Ella Minnow Pea lover, I'm so glad! I totally have the Jaws theme music in my head now ;) Dun Dun Dun Dun Dun! I'm going to have to check out "Ella Minnow Pea"! I like the Top Ten Tuesday, but sometimes I need to take a break because I feel like my lists can get repetitive. I was looking ahead at TTT themes. Some of them look like they'll be fun and some look like a lot of work, lol. A new baby niece! Oh, fun! I love being an aunt so much :D Congrats! Love Water Memory is a great book! These are some great picks! Thanks :D I was a fan of that one and I think the watery theme really fits in here. Also, your gif is a winner. I love that we can do whatever the heck we want, lol. Thanks!! I forgot Lost Lake. I may have to add that to my bag, if I don't read it by the time we go to the beach. I don't live anywhere near the ocean so Jaws isn't quite as dangerous to read, lol. The only thing that touches me in the lake might be a weed, ha! Those gross me out. I read Jaws last summer. It was a great read but one of the story lines was very different from the movie and I actually prefer the direction the movie went instead. A first! BTW, I saw your post on FB about the accident. Are you okay? How are you doing? Wow, that's a very rare happening! I should read the book and watch the movie in quick succession to see what I notice. It's been a long time since I've done either. Bahahaha! Love your faux pas and the GIF. AJ Fikry is the perfect summer beach read...even if you don't end up going to the beach. Hope you're feeling better! Thank you ;) I'm full of faux pas, believe you me! Ha! I'm going to go look up Ella Minnow Pea. Thanks for the recommendation! Awesome! It's such a good read, I hope you find it! Welcome to TTT! I have to read Jaws one day. Great list! It's kinda perfect for beach reading. I'm itching to do just that! Oh gosh, I do not thing I could do Jaws on the beach! My sister is terrified of sharks, so I think she would also hate it! You always have the best gifs! I saw the HP one at work and laughed so hard my coworker came to check on me... Three out of your five are on my TBR pile... None of those are JAWS. Because I don't need more nightmares! Ha ha ha! Hooray for interrupting the work day for a good laugh! Great list! I also don't get the lighter read things for summer though I have gotten somewhat seasonal. I like lighter reads during winter because my job is insane crazy stressful during that time and winter's in Iowa are brutal. I crave the escape. Summer seems like the time of year I have the brain power to tackle some heavier reads. Ah, that makes sense. Your reading seasons are different than most, which I totally dig! I'm with you, a summer or beach read doesn't have to be light. Personally I don't get out in the sun or beach much, and I live in FL!! I'm too old and get too hot..ha ha. Great choices, lots of variety! Anita, I'm with you! If I'm on a beach it's usually under a pavilion or umbrella ;) The sun is NOT my friend. I'm totally with you -- just because I'm at a beach doesn't mean I want to read fluff, but I also don't want to tote around Anna Karenina. Gone Girl was my lake read a few years ago, and it fit the bill perfectly! Ohhh yeah, I can see how Gone Girl would be a great beach book! Faux passes? LOL, I don't know! I hope you do get to Love Water Memory. It's an interesting premise. That's also what I think of when the term beach reads comes up. Fluffy fluff. Like Danielle Steele fluff, ha. It's SO good. It's short and sweet too...hint hint! A lot of my blogger pals participate in this one. I don't know why I put it off for so long! How dare they disregard your picks! ;) Seriously though, they really missed out by not choosing Fikry. It's excellent. That gif... I just don't know what to think... LOL!! I haven't read any of these! I agree that beach reading doesn't have to be easily digestible. I just wish I were going on vacation some point soon! Summer is often the busiest time in the office for me. Only five books? You will probably be shunned! But that GIF is hysterical so you may be forgiven. I keep expecting the book community to exclude me from their ranks ;) Thank goodness for ridiculous Harry Potter gifs! First time I've come across Ella Minnow Pea - sounds totally up my alley - thanks! I keep on picking up Lost Lake in store and then putting it down again. Not sure about it yet. You can read these in the winter as well, I promise!! ;) Lost Lake is a nice breezy read, I think you'd enjoy it. LMAO that gif. Ella Minnow Pea is a great pick!! I really need to get my own copy of that book, I liked it a lot.